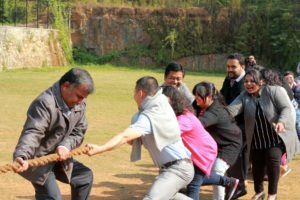 It has been a tradition of the University’s faculty and staffs to get together at the end of every year for a day of fun and appreciation of the contribution and hard work, the commitment and achievement of each and every one, a time to meet and greet each other’s family members and relatives. 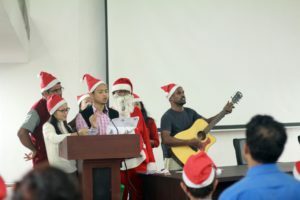 This year, the Appreciation Day was held on 7th December at Tapesia Campus. The programme began at Football ground with the hosts – Ms Mebari Dorphang and Mr. Chanlang Bareh serenating the gathering with a cover of a song titled ‘Blessings’ by Laura Story, a song befitting the occasion perfectly. Fr Francis then led the crowd with a prayer. After this some outdoor games were played, followed by breakfast. 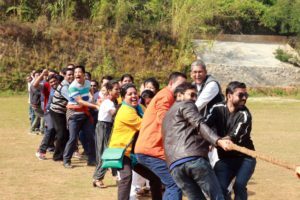 In the afternoon, a movie ‘Mama Mia – Here we go again’ was shown in the Auditorium of Academic Block I, which was much enjoyed by all. At the end of the movie, carol singers led us in singing some of the most loved Christmas carols. The Appreciation Day ended with the Vice Chancellor’s ‘Thank You Speech’ and handing out of gifts to each member of the Don Bosco University family.